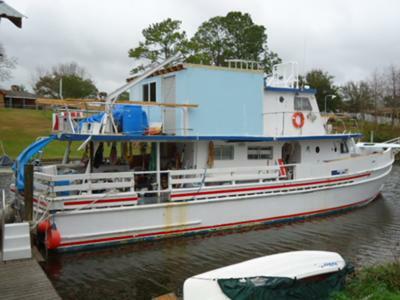 1967 59'.6" Carolina (70'Overall) she was a fishing headboat (49 passengers), now converting to live aboard. So far it is mostly original. I have built a house on the upper deck 14' x 14' x 10' high. The house on the upper is just built on the upper deck and only attached by nails to deck. I know it needs to somehow needs more structural support to lower deck. Not finished, only framed and outer ply and roof with canvas over and expoxy and coated with rv thick white, 2 metal doors, and 1 sliding window so far. I want to add big bay window port side next to bed. The vessel size is 70' x 18'. I'm thinking of taking it to Haiti or Mexico or (?) to have a complete remodel. Do I buy most of what I want on boat here in Mississippi first, like furniture, kitchen appliances, etc.? Do I buy what lumber here in U.S. or in other countries? 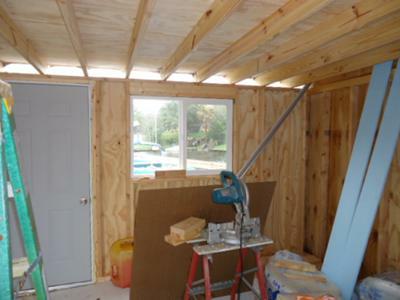 Will I find marine craftsmen that know about structural? I'm told good craftsmen low cost Haiti, Honduras, Costa Rica? The 871N Detroit's are very low hours rebuilt factory 2005-2006. The hull is glass over wood and the diver says sound? I want to expand the lower deck to be one large room and divided into a modern look. So I start soon on my new adventure. I hope to leave Mississippi by May 15th, 2011. I have a lot of work to do in the next few months while I am cruising and hope to enjoy all the while. I am 71 have been a Licensed Capt since 1985, but did not renew 2000. I have been in all the waters coastal from Dutch Harbor,AK to Mexico and everywhere in-between. Also Miami to Key West. Now I want to head to Costa Rica, Panama, maybe Sea of Cortes, but may stay Costa Rica? Sea of Cortes would be closer to family, but not sure of the weather and where I can drop the hook for free. I want nice place to retire, live on the hook, nice cove, near a small town, nice people, no Hurricane’s. Run the gen set, some solar. I started a personal website at cruisingwaterworld.com/70 and will add to it when I get the time, right now just in beginning stages. Hoping to get it all working one of these days. Not sure blogs work yet. Comments for "Splash of Lime"
It's great for someone to say do your remodel in the U.S. I would of course but can't afford to. I am lucky to even own the vessel. I have very little money for remodel but when they work for $15 to $25 a day in Guatemala and good wood craftsmen and best wood then what else can I do? Price in the U.S. beside big money for dry dock, craftsmen work for $75 to $100 an hour. So all you naysayers might pitch in and send me some bucks and get it done in the U.S. Thanks for the great messages. Taking a boat from USA to some foreign country to save a few bucks as bad as people in the USA need jobs. Why don`t you stay over there with them. The USA does not need you.We have too many like you already. Saw this vessel near Panama City the day before Thanksgiving, hope you were able to save her before sinking and hope the crew is safe! Give it a break, read what I need to have done, if you can't read then ask someone. Is it that hard to tell me about a nice boat yard in Nicaragua that can remodel my boat. Who are they and how do I get a hold of them? Got any email addresses, thanks. I need to do this soon, as the weather won't stay nice forever. I'm in Mississippi and I need to go now. So drop an intelligent message to me, if that is possible, thanks. Anybody want to give a real answer, frig how it looks now, did anyone read that it is going to be remodled lower deck and upper deck. . . . I'm sure that won't rings any bells, or maybe it does, that's when you turn cap sideways, now I have the right group. Well go zap someone else, I'm very busy to have to listen to knot Heads. I need good advice about what yard to use from Belize to Panama or any in-between. I haven't checked into Nicaragua yet. But I think I will. If you can climb out of the bottle long enough to tell me about a nice boat yard that does great work and has a rail that can get my 60' vessel out of the water without breaking her, let me know and I would appreciate that, thanks guys, you have been real. . . . THANKS, BUT IT IS A TEMP ROOM. I have to have somewhere to live while the lower deck is remodeled, but I guess some people commit before reading. Thanks and good luck and tell me you would probable live in a sleeping bag on the bow. . . It comes down when the vessel is remodeled, not if anyone has a real answer about Honduras boat yard or Guatemala with experience I would appreciate it. True, the room at the top is temporary. But for now I can make it livable and hopefully put all my personal belongings up there. Then I want to take it to a foreign country to have it totally remodeled starting on the lower deck. I can't afford to do it here. So choices I have been given are, Cuba, Haiti, Mexico, Honduras, Costa Rica and Panama? I really don't care where. I want to know private details like, who can I call? Who do I talk to and exact location, harbor, etc. I need the true details and I also need to have the plans done up of what I want to have done upper and lower. I have been told top craftsmen, $15 a day, you can get a whole crew $50 to $100 a day, have it all done in a week or two. Built-ins, everything. $5,000 to $10,000. Well that all sounds good to me, I just need more details then conversation, I need phone numbers, details. Anyone wants to jump in here, thanks. Sorry Captain, but best thing you could do with the shed is heave it overboard. I know beauty is in the eye of the beholder but to my mind it just makes an otherwise fine boat look stupid. 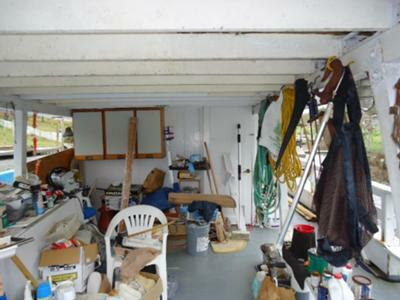 Would it not be better and easier to enclose some of that lower deck? Take that box off the upper deck in case it capsizes in bad weather.